Yard sales and flea markets are a fun weekend activity. There is no end to the great bargains you can find. Who doesn’t like good old-fashioned haggling on the marked price of the merchandise? 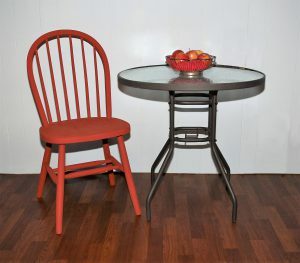 One of my favorite items to look for is unique furniture that can be refinished and re-purposed. Recently my wife found a couple of Windsor style wooden chairs with the spindle backs. The black paint was flaking and the chairs were pretty worn, but they still had a lot of life left in them. They just needed to be stripped, sanded and repainted. She planned to use them around a glass-top wrought iron table she also picked up at a yard sale. Last weekend, the restoration project began. With stripper, scraper and rubber gloves ready, my wife and I began to work on the yard sale finds. By carefully following the directions on the can, the paint stripper was applied and allowed to set for 15 minutes. Then came the fun part of scraping. The paint came off fairly easily, but a second application was applied to make sure we got all the paint off. Once the paint was removed, a good sanding with a small electric palm sander removed the rough spots and prepared the chairs for the Milk Paint finish. 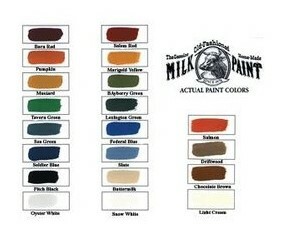 I chose the Salem Red Old Fashioned Milk Paint sold by Van Dyke’s Restorers. 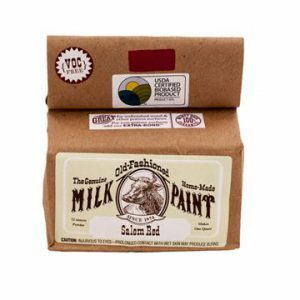 The paint comes in powdered form in a brown paper bag and is mixed with water at a 1-to-1 ratio. Milk Paint is a non-toxic, water-based paint made from milk and lime with pigments added. Milk Paint should be mixed with water the day it is to be used. Borax is sometimes added to assist with dissolving the casein (milk proteins). This unconv entional paint is popular among furniture restorers and craftsmen because of its unique finish and because it is all natural. It is used as an alternative to oil-based paints in home interiors for those who are allergic to modern paints. This time-honored favorite does not produce perfectly uniform color, but instead offers subtle differences of shading. Because it is water-based, Milk Paint goes on thinner than oil-based paints and requires several coats with light sanding between coats. It produces a rich, lustrous finish that improves over time. Van Dyke’s offers the original milk paint formula in an array of historic colors. It is an excellent choice for restoration or reproduction finishes. Paint can be mixed with snow white to obtain different shades. Once mixed, liquid milk paint will keep overnight when sealed and refrigerated. The powder will last indefinitely if kept sealed. Milk Extra Bond is a concentrated acrylic that gives greater adhesion to non-porous or previously painted surfaces. 1 – Mix powder with equal parts water. 2 – Stir to a smooth consistency. 3 – If mixture is too thick, add a little more water. 4 – Make sure surface to be painted is free of oil and dust. It is recommended you vacuum and clean surface with a dry cloth. 5 – After applying first coat, allow to dry thoroughly, then sand lightly with 220-320 grit sand paper. 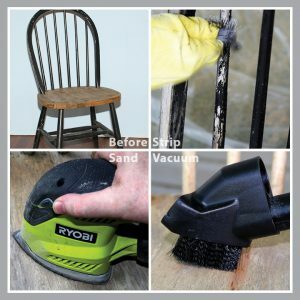 6 – Remove all dust with vacuum and cloth. 7 – Apply 2nd coat. 8 – Paint will have a brush stroke look. You can also apply paint with a sponge to prevent the brush stroke effect.